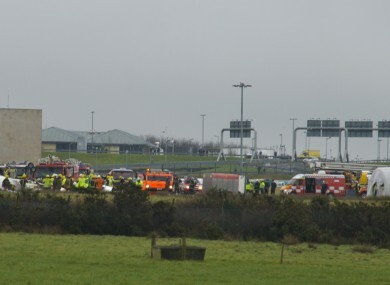 AUTHORITIES FROM BRITAIN and Spain are on their way to Cork to assist in the investigation into this morning’s fatal plane crash involving a Manx2 commuter plane travelling from Belfast to Cork. Jurgen Whyte, chief inspector of air accidents at the air accident investigation unit, said there were 12 people in total on board, but it wasn’t known if there were two or three crew. He said in normal circumstances, there would be two pilots and a steward on the flight. He added that the scene had been preserved and that the investigation would have Spanish involvement, as the aircraft had been leased from the Barcelona-based Flightline BCN. UK authorities had offered assistance in the investigation, and that offer had been accepted, he added. He said he could not confirm that the plane had made two attempts to land before crashing on its third attempt. “Until we review the tapes and talk to air traffic control, I can’t give that information,” he said. He confirmed that a loud bang had been heard as the plane was landing, before it diverted and caught fire. Asked whether there was any suggestion the flight should have been diverted to another airport because of the heavy fog, he said he didn’t know at this stage. Email “UK authorities to assist in investigation into Cork plane crash”. Feedback on “UK authorities to assist in investigation into Cork plane crash”.